St. Martin's Griffin, 9781250135841, 160pp. Poke cakes mean fun and flavor in no time! With no stress and using ingredients already in your pantry, authors Roxanne Wyss and Kathy Moore will show you how to create flavorful cakes that will win rave reviews. Begin with a simple cake, whether made from scratch or from a box mix, but then transform it into something spectacular by adding an array of glazes, puddings, and sauces. Poking holes in the top of the cake allows the toppings to absorb into the cake, soaking every cranny and crumb with flavor, and producing a decadent dessert that is as effortless as it is delicious. Finish if off with a fluffy whipped topping or a sweet buttercream, and suddenly that everyday cake is new, unique, and oh-so-tasty. 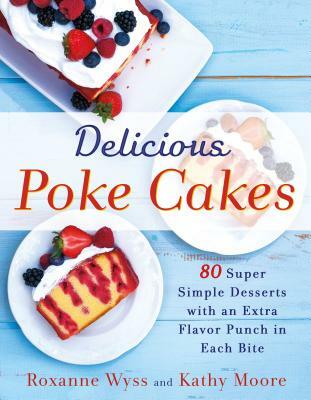 Inside Delicious Poke Cakes you’ll find 80 quick and simple recipes, along with tips and tricks that will have you snacking on poke cake in no time. Whether you prefer fresh fruit, rich chocolate, or even a more adult cake with a dash of alcohol, there is a poke cake for every occasion. Just poke, pour, and enjoy!